CHARLOTTE, N.C. -- Police in Charlotte say four people have been arrested at protests in uptown after a prosecutor announced a decision on the shooting investigation into the death of Keith Lamont Scott, CBS affiliate WBTV reported. Charlotte-Mecklenburg District Attorney R. Andrew Murray said during a press conference Wednesday that he will not be charging officer Brentley Vinson in the shooting death of Scott. Vinson has been on administrative leave as authorities investigate. During the press conference, Murray played video recording of Vinson explaining his actions to police investigators. Vinson fired four shots, striking Scott three times, in the chest, abdomen and wrist. In a statement released Wednesday, Scott’s family said they were “profoundly disappointed” in Murray’s decision not to charge Vinson. “All our family wanted was justice and for these members of law enforcement to understand that what they did was wrong,” the family said. 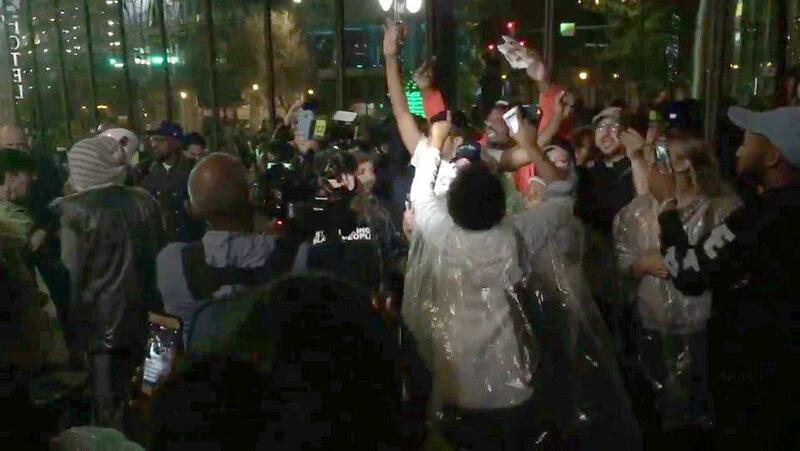 Protesters gathered around CMPD’s headquarters Wednesday night around 6:30 p.m. to protest the decision. The group marched for several hours Wednesday night. According to CMP, three people were arrested before 9 p.m. for obstructing traffic uptown. It’s not clear what the fourth arrest was for. Plainclothes officers were at the apartment complex where Scott was shot on Sept. 20 to serve a warrant unrelated to him. They said that Scott pulled into the parking lot and parked beside an unmarked police car with officers officers inside. Murray said a gun was recovered at the scene with Scott’s DNA on it. The safety was off, and the gun was cocked, according to Murray. In video from the aftermath of the shooting, Scott’s wife Rakeyia Scott can be heard yelling that he was unarmed. In an interview with CBS News on Oct. 13, she repeated that claim. “He had no gun. He was not a threat. He was just not a threat, period,” Rakeyia Scott said. Murray said during the press conference that investigators obtained text messages between Keith and Rakeyia Scott, from about a month before the shooting, in which they argued about his ownership of a gun. Murray also displayed a series of text messages between a purported gun seller and a third party, in which the gun seller said he recognized the gun and customized holster. The alleged gun seller said he felt bad about Scott’s death, and that he felt like he played a part in it. In a separate press conference after Murray’s announcement, attorneys for Rakeyia Scott said they are still investigating the case, while waiting for the prosecutor’s office to turn over its case file. “We still have concerns, this doesn’t end our inquiry,” said Charles Monnett, an attorney for Rakeyia Scott. He pointed to questions surrounding the officers’ approach in the moments before the shooting, noting that Rakeyia Scott could be heard on video informing officers that Keith Scott had previously suffered a traumatic brain injury. The shooting set off several days of protests throughout Charlotte and in other cities. On Sept. 21, Justin Ross, a 26-year-old, was shot and killed during a protest. A suspect was arrested two days later. In a statement released Wednesday afternoon, the U.S. Justice Department said it will review the case to determine whether a federal civil rights investigation is warranted.